As I set out to write this Envision Festival Review + Guide, I had trouble deciding where to begin. 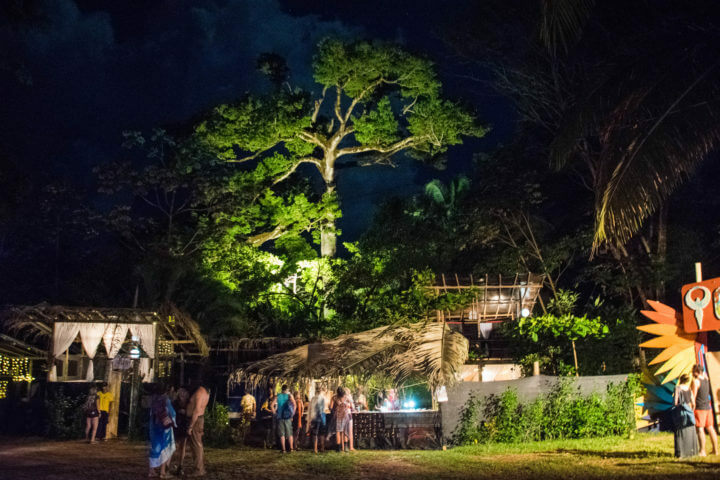 This music festival was more of an entire Envision experience, taking place in a beautiful location in a beachside jungle in Uvita, Costa Rica. Although I knew before that Envision is so much more than a music festival, the weekend made that more clear than ever. 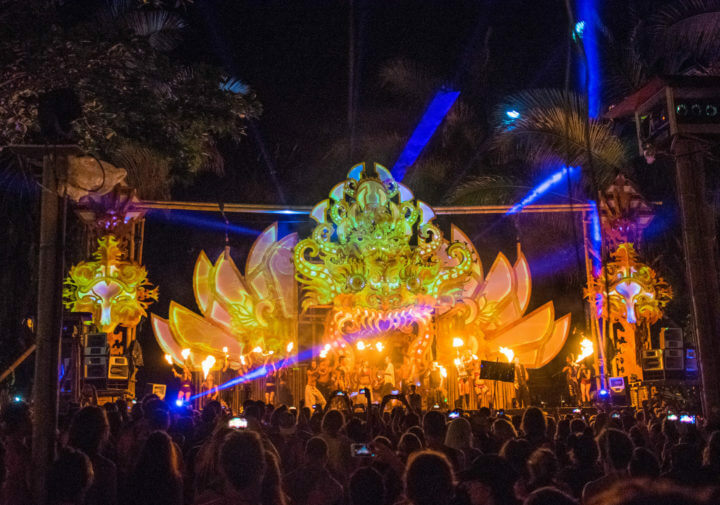 As one of the leading transformational festivals in Central America, Envision Festival truly takes the ‘transformational’ part to another level. It has the 8 Pillars of Envision Festival upon which it builds its foundations, and music is only one of them! 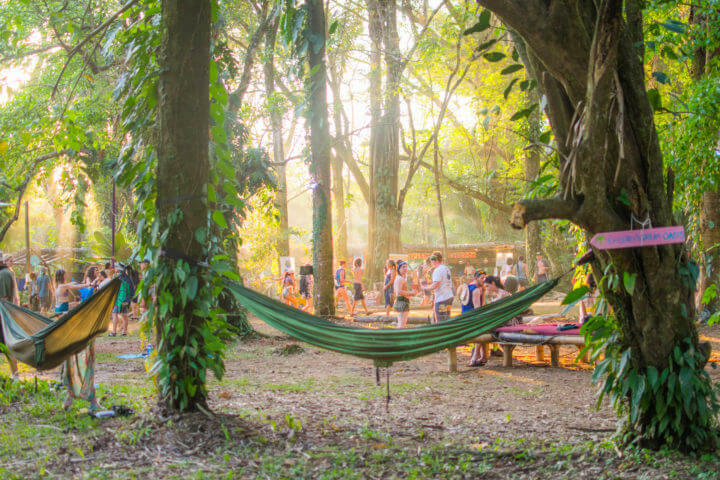 Read on to hear all about that is by far the best festival in Costa Rica. Psssst! 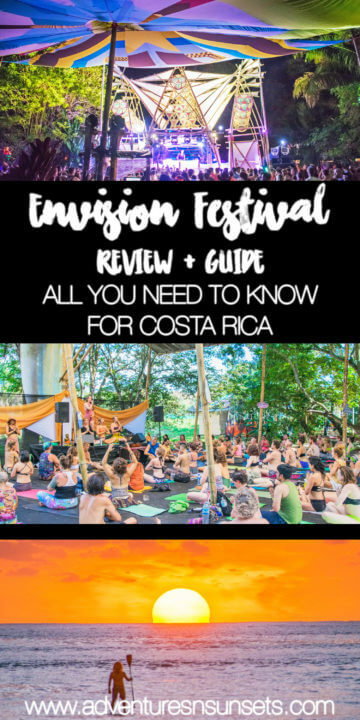 Before you continue, this Envision Festival review is EXTENSIVE and over 5k words and 18 categories all about Envision Festival Costa Rica. Why not Pin it to your Pinterest boards to save it for later too? People did come to Envision festival to party and enjoy the (amazing) music lineup, sure, but people more came with the actual intent to transform themselves through awakening new potentials, learning from influential people and ideas, and connecting to a buzzing conscious energy that emanated from each and every person. People here really knew what this gathering was about, and it showed. It was more than a party. There was work to be done on each person there, and everyone was quick to get to it. It was inclusive, it was beautiful, it was musical, and it was soulful, and I couldn’t be happier that I went. 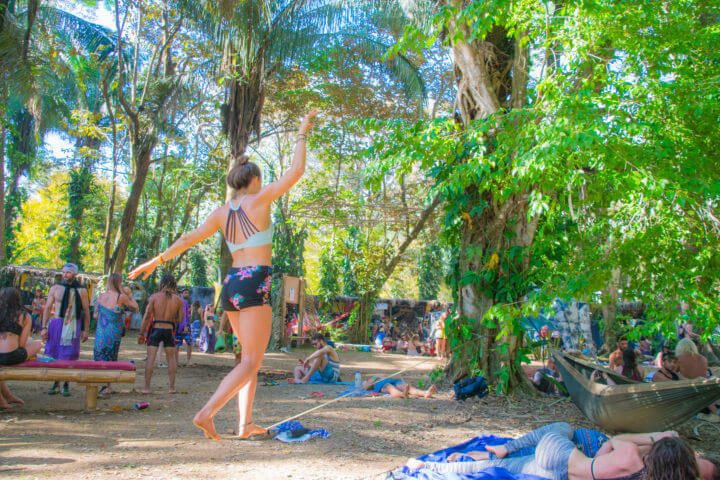 Without further ado, let’s get to my classic 17+ categories of each festival I go to, organized to make sure anyone who went to Envision Festival can look back fondly at their experience, or anyone who plans to go will know absolutely everything they need to make the most of their weekend. ALSO: – If you would like to see my complete Envision Costa Rica photo album, CLICK HERE! Staying Longer in Costa Rica? 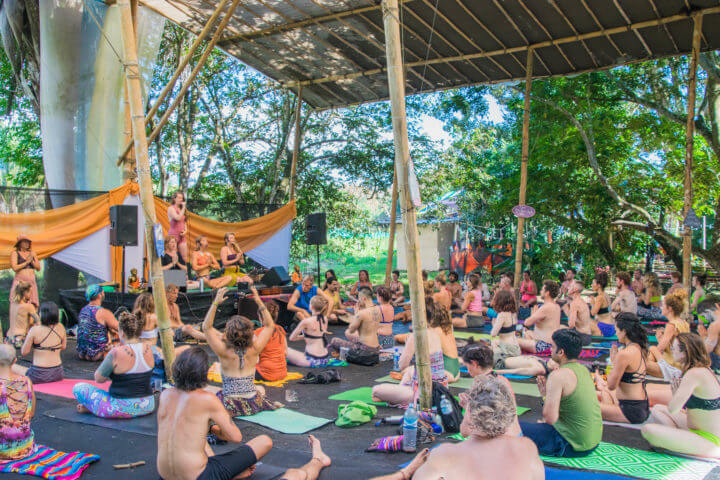 Envision Festival is held at Rancho La Merced on the coast of Uvita, Costa Rica. This is on Costa Rica’s Western coast, on the Pacific ocean (see below for transportation tips!). The Pacific is nice and warm in Central America, and lots of people enjoy surfing the gentle waves during the day. Rancho La Merced is a beautiful jungle area just inland from the sea. There are many grass/dirt areas shaded by massive trees throughout. 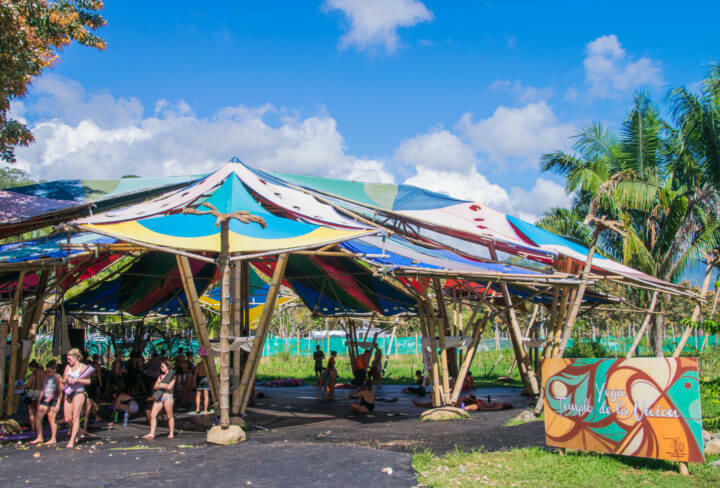 The site is actually quite small, and is very simply split up into camping areas, the village/food area, three different stages, and five or six different yoga, speaking, workshop, or ceremony areas. 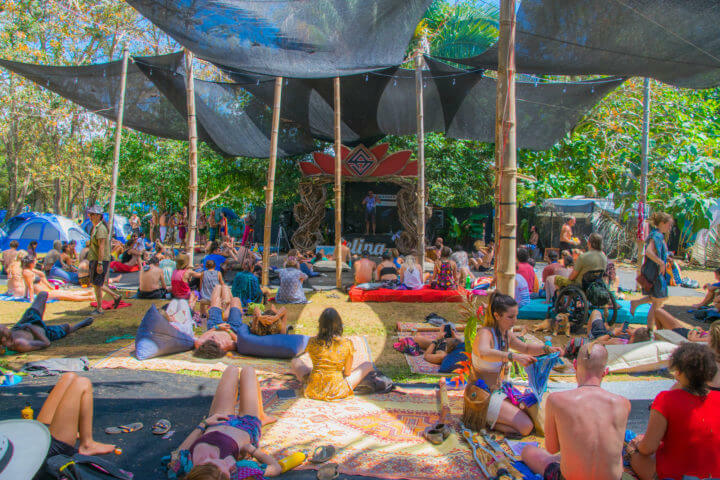 The Village is a lovely shaded gathering place at Envision Festival with a stage, food stalls, lots of amazing markets, and tons of space to set up slack lines, form drum circles, or lay out a tapestry and have a nap. The Village stage had lots of speakers and workshops during the day, many of which focused on plant and agriculture/sustainability/eco-friendly/ancient healing practices, and had smaller bands play shows at night. The Village is where all the food stalls at Envision festival were lined up as well. There were plenty of great options, of which I will go into more detail below. The market stalls here were also very diverse, with lots of festie-fashion, jewelry, oils, and other fun stuff. Festival goers may take a short path from the venue to the beach during the day, but this path does close around 5:30pm/sunset time for safety reasons. The beach is an absolutely amazing aspect of Envision Festival, and people gather there each night to watch a spectacular sunset over the ocean. At sunset time thousands of people gather on the beach, hooping, swimming, doing acro yoga, and even fire spinning. 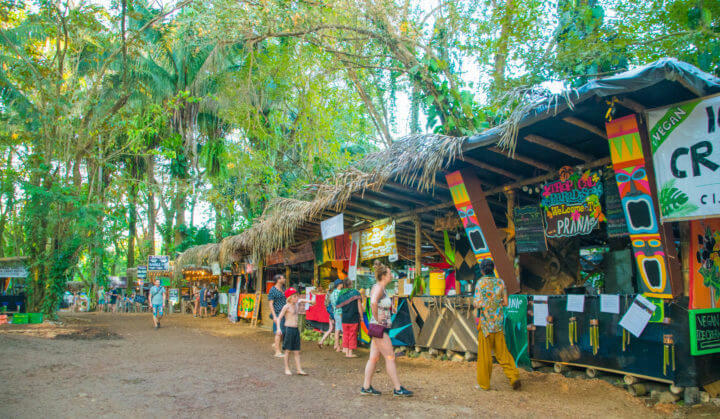 The path to the beach is also full of vendors selling all kinds of food, cacao, jewelry, clothes, $2 beers, drinks, and more. The beach is a great option to save a few bucks on drinks and food, because it’s cheaper there than inside the festival! I liked to wake up in the morning and head straight to the beach for a morning swim, snack, and maybe a cacao wake-up boost. This stage runs Friday-Sunday and could be considered the main stage for live performances. Headliners like Bob Moses, Xavier Rudd, and Matanza played here. Envision does have a big focus on bass music (glitch, trap, etc) and the Luna stage really brought this focus to life. The Luna stage was DECKED out – with live (and displayed) art literally all over the place, insane lighting and speakers, and one of the coolest fire setups I have seen in my festival time. At certain intervals (heavy bass drops of course) the entire area would erupt in a burst of warm fire, from about 8-10 pillars set up all around the area. At the back of the Luna stage was an amazing art gallery with an array of interesting and psychedelic art pieces to wander around and look at. Lapa is where I spent most of my time! 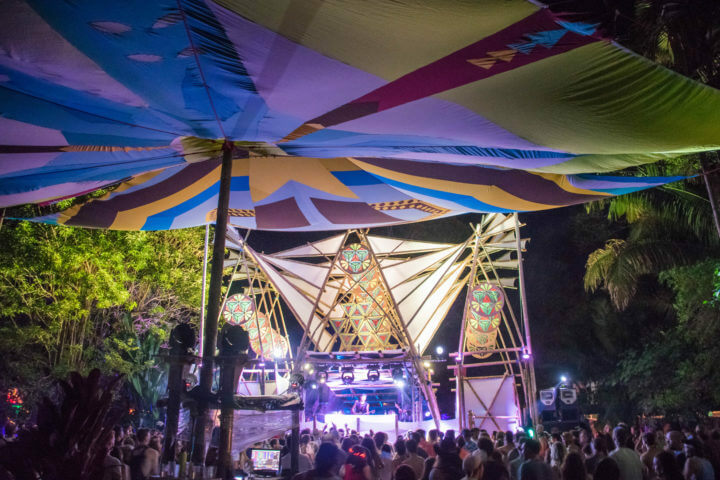 😉 The Lapa stage was home to all the deep house, funk, and techno of the festival, and was located a bit more tucked away near the entrance to the beach. The lighting and production here was amazing, but couldn’t really compare to that of Luna! 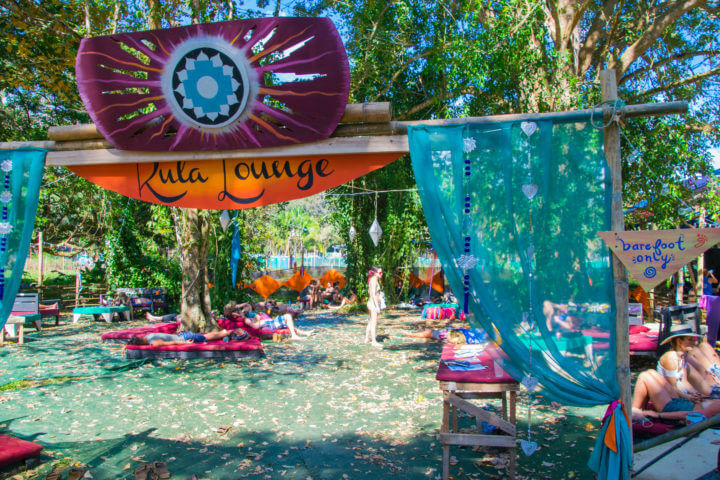 No Envision Festival review is complete without mentioning all the awesome yoga and workshops! There were two yoga areas, the Yoga Templo Auspicio and the Yoga Templo de la Union. Both areas had much more than yoga, however, and had a schedule each day for different workshops, varieties of yoga, and meditations. The Yoga Templo Auspicio had a wider variety of spiritual practices, and the Templo de la Union focused more on different aspects of yoga. I did some amazing yoga classes, some meditations, a life changing ‘breathwork’ session, and more! This ‘Breath of One’ workshop with Gregorio Avanzini was one of the most unexpected and profound experiences I have ever had. Through different breathing techniques and proper coaching, dozens of people were able to access and unearth deeper parts of their subconscious. It was full of emotion, letting things go, bringing dark things to light, and more. It’s hard for me to even explain in words on a page or even in person, but if there’s on thing I would recommend trying it is this breath work! This was another lovely chill area with bean bags, mattresses, and a schedule of speakers each day. I saw some talks on decentralization, managing stress and anxiety, and a fascinating plant mediation where scientists attached lie detector (energy measuring) electrodes to a plant and we could hear its energy. The Red Tent was a lovely gathering space at Envision Festival focused on women and feminine energy. It had many empowering talks, song sessions, and ceremonies. I attended an incredible song celebration simply because I heard it from my tent as I was getting ready for the night. The song that drew me in was a call and return song between women and men. This exchange was so beautiful and full of acceptance that I couldn’t help but be completely dumbfounded to what I had stumbled across. During the last few chants everyone stood up and danced and clapped, and I thought that more exchanges of ideas like this between women and men in society would help a great deal! I stayed for the entire song ceremony for what must have been a few hours; it was such beautiful and empowering energy for both men and women. The Herbal Clinic was there for anyone with any type of ailment to give advice of natural and herbal healing processes and first aid. The crowd at Envision was quite international, but definitely had large concentrations of Californians, Canadians, Germans, and Costa Ricans of course! A lot of people flew in for this specifically as a destination festival, but many also ended up there on a leg of some longer travels. 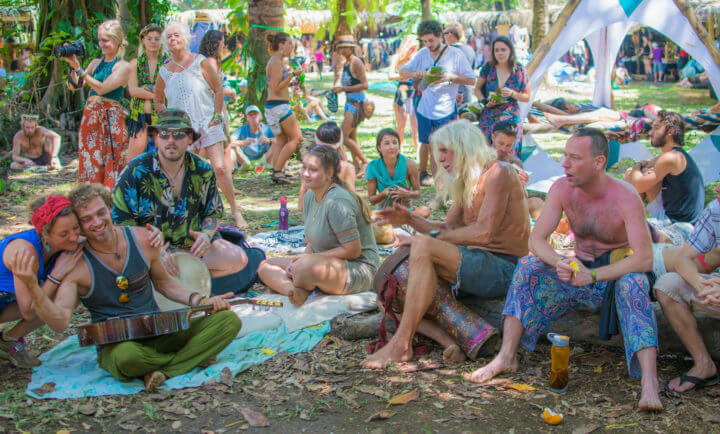 I’m not going to lie; the crowd at Envision festival to any outsider would honestly look like a crowd of textbook hippies. Dreadlocks, crystals, and tie dye ran rampant, but these weren’t the type of hippies who just dress the part. People here really embodied the lifestyle that they portrayed, and were welcoming, conscious, kind, inclusive, and happy. Spanish was spoken quite often in conversation but the workshops and yoga etc were all in English. Envision’s atmosphere was lovely! It was already situated amidst amazing jungle trees and palms, and this feeling of being in the middle of nature was intensified by the decorations and atmosphere around the grounds. There was a lot of art and installations all over the place, and the feeling was quite psychedelic in the stage design, colors, and setups. The main stages are made of intricately carved, layered, and patterned wood in the shapes of serpents and dragons, upon which colorful and twisting light is shone. I’m not sure how they do it to be honest, but the light hit the different facets of the stages perfectly and created an amazing moving art piece in itself. Bob Moses AKA the love(s) of my life doing his thang. Envision has a variety of music that is heavily focused on bass music. The Luna stage is very obviously and clearly the most decked out of all the stages, and this is the stage with glitch, bass, and trap artists. Over the years this stage has hosted the likes of like Clozee, Opiuo, Diamond Saints, Thriftworks, Shpongle, Random Rab, IHF, Troyboii, and Soohan. The Luna stage is the full Envision experience with live art, galleries, fire, and performers/acrobatics during almost every set. The other two stages, although not as fancy, also have fantastic artists playing. 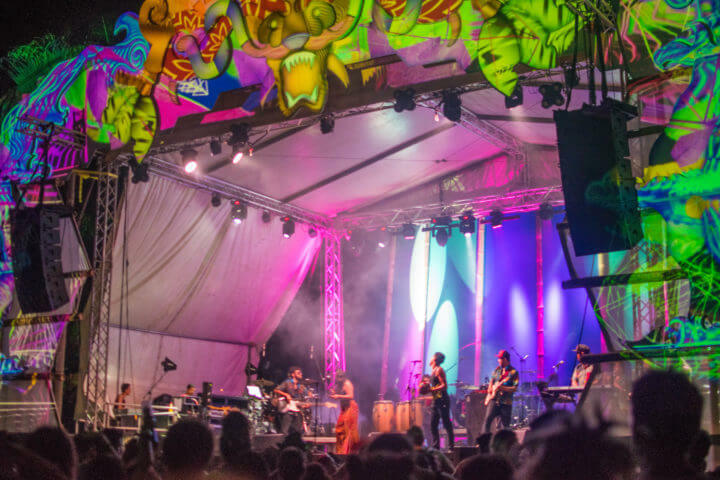 You can expect live performances such as Bob Moses, Beats Antique, Xavier Rudd, Matanza, Autograf, Goldfish, and Santos Y Zurdo at the Sol Stage – all varying genres of live shows. The genres here range from deep house to Costa Rican folk, and it’s always interesting to pass by the Sol stage to see what they are paying that day. 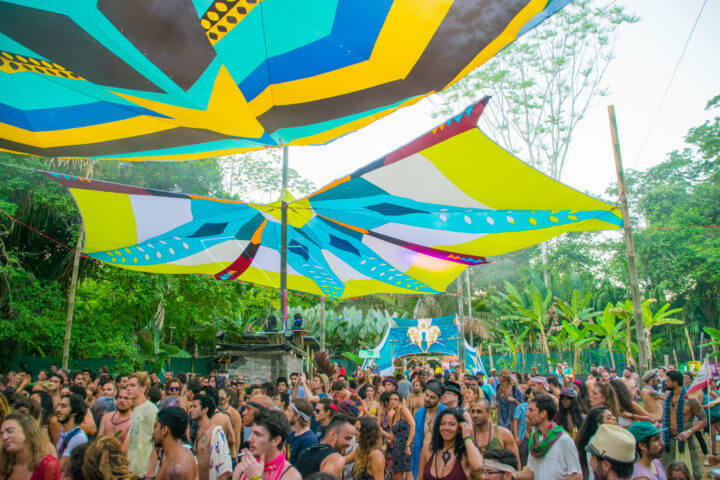 The Lapa stage is the haven of all house & techno. You can expect names like Monolink, Acid Pauli, Audiofly, Tara Brooks, Bedouin, Ivan Cespedes, Blond:ish, DJ Tennis, and Be Svendsen at the Lapa stage – all great names in the house, techno, and melodic scene. As a camping festival, your ticket to Envision festival comes with access to camping. I would say that most people camp, although some do stay in hotels and hostels nearby (see below). Envision has a few designated camping areas and spaces, in which you can set up wherever you want. Some people with early arrival passes arrive on the Wednesday and clear out a lot of the best (read: most shaded) camping spots, but you can always squeeze yourself in somewhere shaded. If I could give you one camping tip for Envision Festival it would be to camp in the shade if you want to get any sleep at all! The camping is pretty much a free-for-all and some spots are closer or farther away from the stages. I camped just behind the Village which was perfect for me and very close to go out and get food or listen to a talk at the Village Stage. Read more of my best Music Festival Hacks + Tips for any festival! There are a few clamping/special camping options at Envision which I will list below! This camp is farther away from the rest of the festival and directly next to the yoga tents, for any dedicated yogis out there! It was dorm style and seemed to have nicer amenities, private bathrooms, and a nice sense of yoga community. The volunteers (there are a lot of them if you are interested in working!) camped in a special area with pre-erected and spacious tents. There are loads of different options for Envision VIP. There is a designated camping area for VIP attendees that a pleb like me could not even go into. But as you can see on the website it seems that this area is nice and luxurious and worth a bit of extra money. VIP also has its own fancy bar area directly between the three stages. The VIP area apparently has happy hour each night, and its own cabanas for rent all over the venue. 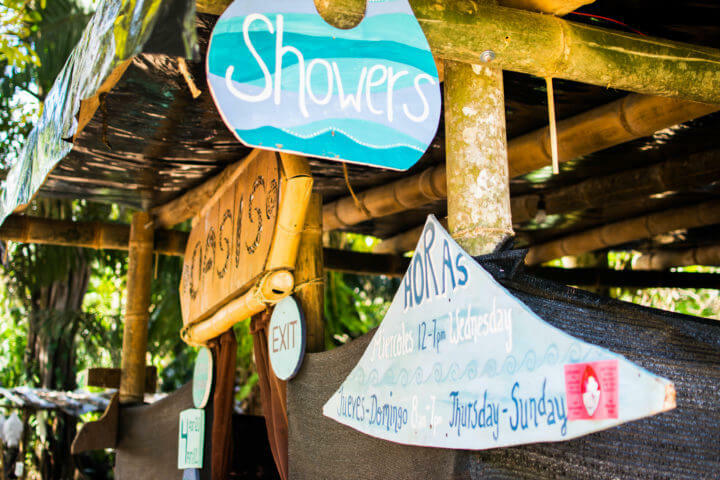 There are multiple different types of VIP Cabanas, bungalows, and treehouses available for Envision Festival, all of which look incredibly luxurious and awesome. Many have viewing platforms of different stages, living areas, and more. One day! As I said before, the Envision festival location is very small (you can walk end to end in less than 10 minutes I would say) and all the camping amenities are also the festival amenities. Your Envision ticket comes with access to camping, and the bathrooms, water taps, and amenities that are available to everyone. 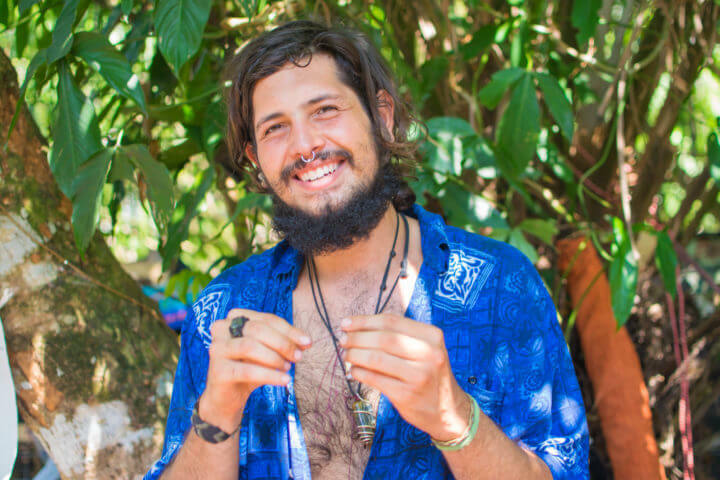 As a leading transformational festival in Central America, there is SO much at Envision festival to do besides music! I would say that music is only a small part of what this festival is about. I have listed specifics above under ‘venue,’ but here are some extra amenities by category. There were performers left and right at Envision festival. They had world class fire spinners, aerialists, and acrobats, and they performed at the Luna stage and also in the Village and around the grounds. These people were seriously incredible and it was jaw-dropping to see some of the shows. It was especially cool to see people flying through the air at the Luna stage during a DJ set. This was super unique and something I really loved about Envision! There are at least 5 or 6 different places where speakers would hold sessions and workshops all day every day. 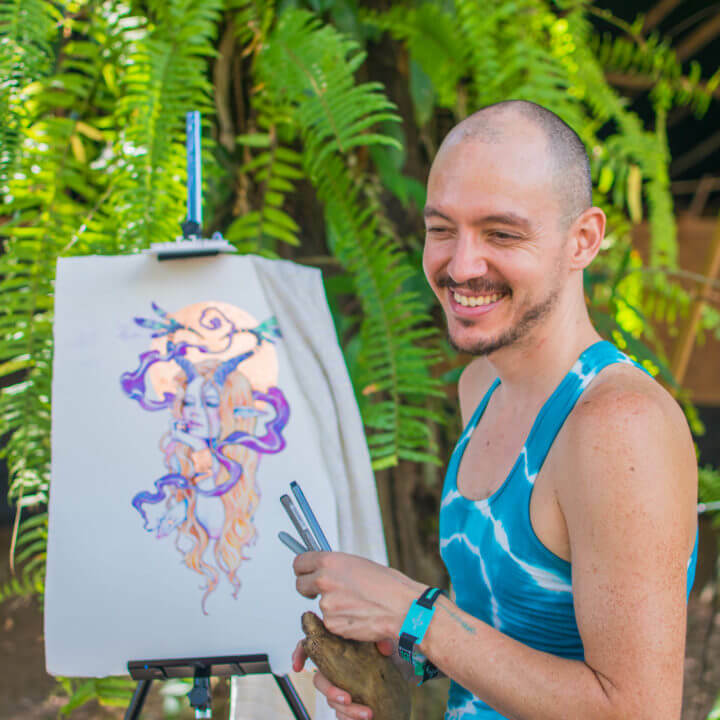 Some workshops you can expect include: psychedelics and society, decentralization, sacredness of housekeeping, moon medicine, crypto currencies and their future, the tantra of sacred commerce, sotrytelling for a cause, and more. The Yoga tents, again, had much more than yoga. Each session had a different name and it was important to check the schedule to see what it was because the name didn’t always make it clear. At the yoga tents you can expect all kinds of yoga, movement, dance, breath work, meditation, acro yoga, and other fun stuff. Yoga was a main aim of this festival and they did it very well! 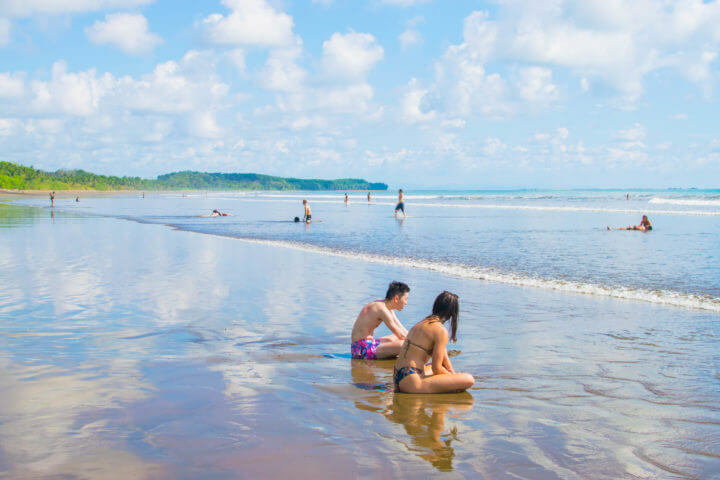 Uvita is a lovely beach on Costa Rica’s southwest coast on the Pacific ocean. Uvita is about 3-4 hours from San Jose, where most people will fly into. There are plenty of cheap flights to San Jose from all over the world – the USA especially. I heard that a lot of people got theirs for $400 or less. To get there from the airport, Envision has shuttles from for $70 per person, which I almost took… but am very happy I did not! 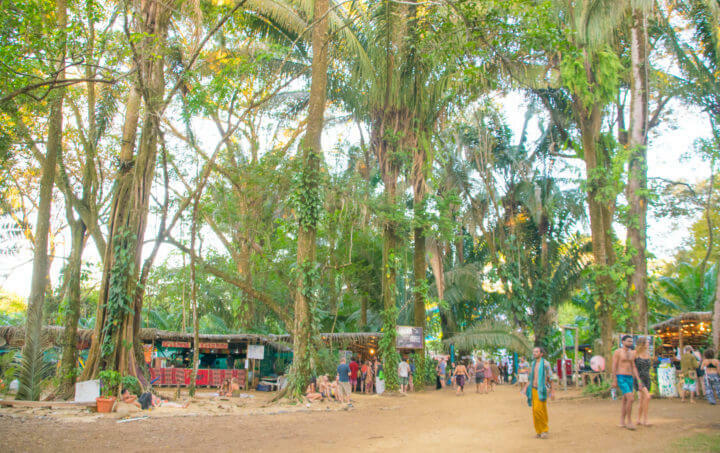 I thought this was my only option as a solo traveler but it turns out there are much cheaper options available – I have to include some money-saving info in my Envision festival review, of course! From the bus station in the city, you can get a public Tracopa bus to Uvita for $15. Factor in an uber/taxi to the bus station and it’s still very cheap! But, remember that the bus does not drop you directly at the festival site, it will drop you in the town which is a taxi ride away from the venue. After getting in crazily early in the morning after a red eye, I took an uber to my friend’s hostel in the city. Uber is actually technically illegal in San Jose, but many/most people still use it. At the hostel we found a group of two more people (making a full uber of 4) and made a deal with a driver to take us to Uvita off the app for $80. So, rather than spending $70, I spent only $20 to get there in a ride share. I think this might be a bit cheaper than a standard uber fare to Uvita, but in that it was off the app the driver made more. I think this is the best option to get to the festival, and you might be able to make a similar deal with a taxi driver too. If you want to stay and explore Costa Rica, you may want to rent a car. Lots of people did this and it can save you money depending on your situation. 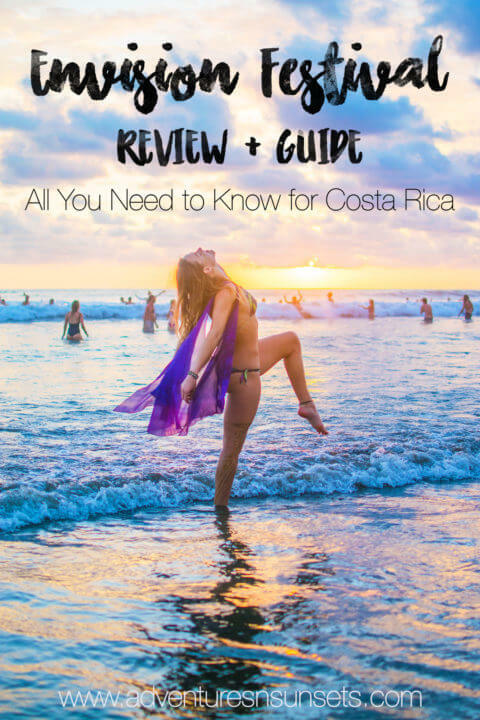 There is so much more to explore in Costa Rica and this would give you the freedom to do so! If you are already traveling, there are many busses (look up Tracopa bus/Ticabus) that will enable you to get to Uvita from Panama or elsewhere in Costa Rica. Me being the marmaid kween that I am. Do you follow me on insta yet?! There is a day parking lot at Envision if you are staying off site and have a car to drive to the festival. As far as I know it is free. If you don’t want to camp, there are a few options for you. Cascada Verde hostel was right down the road and cheap, and U Kinca hostel was probably the closest and on the same road as the venue.. After the festival I discovered a lovely property called Hotel de Montana Villas Bejuco (couldn’t really find them on many hotel websites but they’re on google maps! 🙂 ) and stayed in a private room for a few nights for $20 (the wifi and view were great and a few other festival-goers stayed here too). Hotel Samsara is where a big group of attendees stayed (and had an after party). Tucan Hotel is cheap and close, or you could go big with some private Villas like the Golden Pineapple Hilltop Villas or the Chic Luxury Villas. Many other people got pretty nice Airbnb’s in the area too. Taxis are all over the place in Uvita and at the festival, and any hotel/hostel should be able to call you one to get to and from the venue. But, it is an extra expense when your ticket already comes with camping. I always say camping makes for the best experience at a festival, and this is especially true at Envision. You are allowed to bring whatever food and drink you want into the festival, and to save money I would recommend a grocery store run and maybe a cooler to come into the campgrounds. That being said, there are many food and drink options here. The village has a massive row of food vendors selling burgers, Indian food, pizza, shakshukas, vegan/veg options, sandwiches, tacos, burritos, empanadas, smoothies, coffee, cacao coffee, and more! As far as drinks go, there are lots of options. There are many different kinds of craft beer, sangria, cocktails, blended daiquiris/margs/pina coladas, and even an alcoholic ginger beer. The options are great and hard to resist! But you can also get cheaper drinks out on the beach. You can expect to pay $8-12USD for a meal and about $6 for a drink (or $2 on the beach). See the ‘money’ section below for specifics! Very responsible with waste and leaving no trace! As far as food goes, you must use a plate coupon or pay a bit extra to use a reusable plate. When you are finished you take your plate to a designated washing area and receive a coupon for it which you can use to get another plate or redeem. 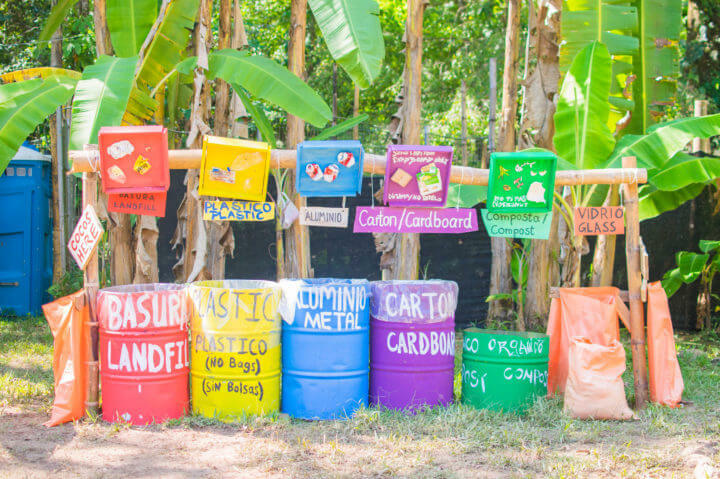 Envision is all about sustainability, and you will see this in the composting and garbage systems, different talks and initiatives, and more. 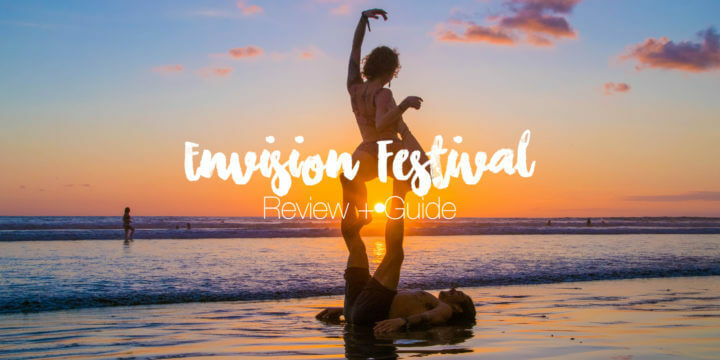 The festival ticket to Envision will be about $360 last minute and maybe $280 early bird – it fully depends on when you buy it. Rental tents etc would be around $80 and VIP can range from $500 to a whole cabana weekend experience with amenities for over $2500. Check prices early! For budgeting, make sure to factor in plane tickets, food/drink/etc costs, transportation, and more if you want to make a festival budget. Personally, I just try to spend as little as possible while still sustaining myself and having a good time. 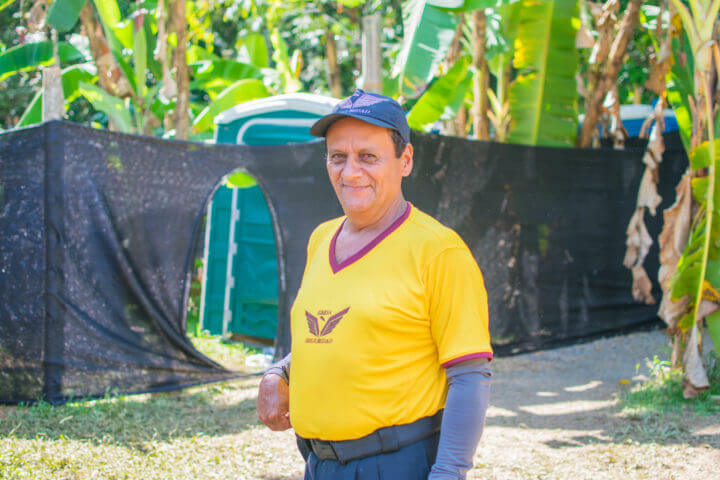 Envision security are mostly Costa Rican locals. The only thing they will check/take from you are glass containers. Glass is the only thing that they will check your bag for as it is a safety hazard. They being said, they don’t mind of you bring alcohol or anything inside as long as its in plastic or tin. You may bring coolers of beers inside or bottles of alcohol decanted into water bottles, and I would recommend doing this to save money! They are also very serious about checking wristbands when you return from the beach. The beach is not technically a part of festival grounds in that anyone can just walk down the beach, so there are multiple wristband checks when you are walking back into the venue from the beach. The beach is also one place I would definitely not bring your valuables in that I have heard of theft happening there as people swim. Costa Rica in February is hot, hot hot! You can already feel how much more humid it is when you arrive from San Jose, and the sun will surely wake you up by 8-10am, 10:30 latest. This is why it’s super important to make sure there’s an extra layer of shade above your tent – either via an EZ-up or trees. My tent was greatly shaded by trees and still somehow managed to be a box of humidity by 10 each morning. Many people simply brought their air mattresses outside or slept on some lounge areas that Envision festival had in the area. While it’s very hot during the day, the temperature will return to a nice and comfortable level at night. Some people brought cardigans for the very early hours of the morning, but you can generally still walk around in a bikini/tank top and shorts at all times of day. One more very important note about Costa Rican weather is that it CAN and probably WILL rain. Ok not just rain… it may POUR. We had a monsoonal downpour on my first night at the festival, leaving the entire grounds slippers and muddy. It was quite the adventure, and trust me when I say I am relieved my tent was waterproof! They covered the grounds with sawdust after the storm and the mud wasn’t too much of a problem afterwards, but just make sure to be prepared! Gettin’ my sunset yoga on. Totally candid. Fashion here is very yogi-hippie. Some people went all out with festival outfits and makeup, but many others just wore bikinis, tanks, or shorts and crochet tops. 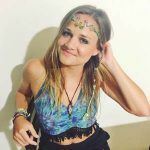 Colorful patterns and fun flowy clothing is the norm, with your classic crystal necklaces, festival jewelry, body paint, and all that fun stuff. I wouldn’t say that people dressed up too much for Envision. Some people did, but it was more the type festival where girls wore no makeup and everyone just dressed comfortable for the heat. The showers here costed money – $6 each or 4 for $20 – and were in my eyes one of the only real reasons staying in a hotel/hostel would be favorable. But hey, the ocean is fine, right?! The Lapa Stage, circa 6:30am one morning. The daytimes were all about workshops, talks, and yoga, which would all run until about 8 or 9pm. Music would start in the early afternoon around 2-4, but headliners would all be suuuuper late the next morning, the earliest being around 11 and the latest groups/dj’s coming on as late as 4-5am. I always felt a strange lull between sunset and ‘party time,’ in that the sunset was before 6pm and the headliners/music I wanted to see wouldn’t be until at least 11. At some festivals the sunset means the onset of the headliners and more intense music-watching time. But here, if you want to stay up for headliners coming on at 3am+, you might have to budget your time a little differently. 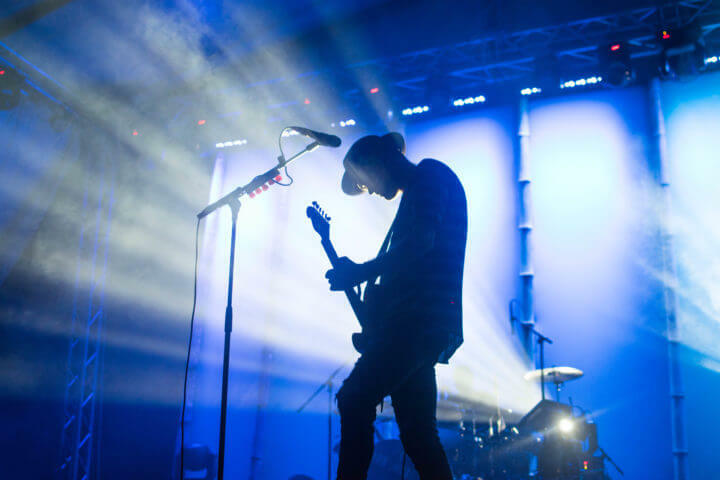 The Luna stage was the one that went the latest most days, and with the latest headliners. The Sol stage would actually finish by around 1-2am most nights, and the Lapa would usually end just before Luna. The schedule was pretty interesting in that the last stage (usually Luna) closed at around 4am on Friday night, around 6am on Saturday night, and at literally 8am on Sunday night/Monday morning. I’m not totally sure what they were going for with this staggered time, and was especially confused when the music stopped at 8am on Monday morning and they expected everyone out of the venue by noon. But, there you have it. Important festival slack time in The Village. In Costa Rica the currency is colones, and these exchange for about 560 or so per 1 US Dollar. However, they accepted both US Dollars and colones here, at an exchange rate of 500 Colones/1USD. Prices will be listed in colones, but food vendors inside out outside the venue on the beach will usually accept USD at this slightly lower exchange rate. You can expect to pay $8-12 USD (4000-6000 colones) for a meal inside, but you can get meat skewers or a falafel on the beach for cheaper. You pay cash for all the food. As far as drinks go, Envision has a token system for these. I’m not sure why they do this for drinks and not food, but you can pay $3USD/1500 colones for one token, and exchange these for drinks. If you want cocktails, some beers, sangria, ginger beer, margaritas, pina coladas, etc, you can expect to pay two tokens, or $6. But they do have great bar options, a selection of beers, and some yummy fruity drinks too. 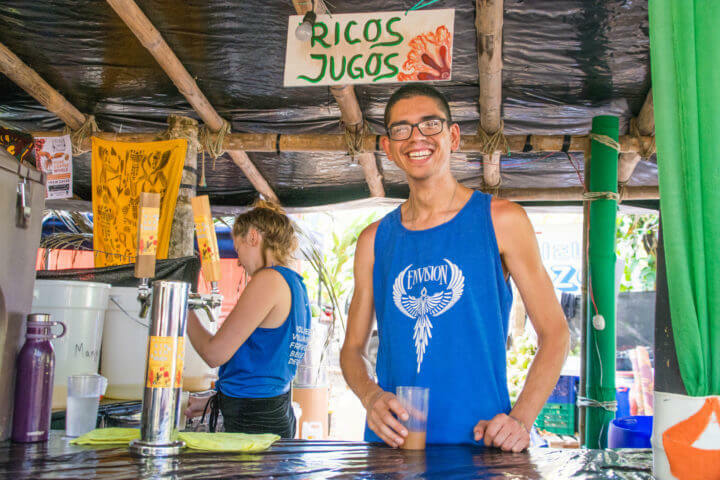 If you want, however, you can get beers outside on the beach for 1000 colones/$2. There are no ATM’s in the venue. There was one ATM but it strangely enough was only for bitcoin. It did fit in with the decentralization theme of the festival but I thought this was strange and don’t know if anyone actually used it. The closest town was about 5 minutes away and had an ATM and supermarket. You can bring anything but glass into the festival. I wish I had grabbed a cheap cooler and brought tons of beer/drinks inside and simply put it down near where I was dancing and grabbed a new drink whenever I needed one. I would have saved tons of money if I could have been bothered to take a taxi into town and grab some supplies from the supermarket. Bring snacks! I survived off of power bars some mornings/evenings when I just needed a pick-me-up rather than buying a whole meal. Make sure to attend some workshops and yoga, and actually check the schedule before doing so. It’s hard to just stumble upon the beginning of a talk/yoga class, so checking the schedule and actually eyeing some interesting ones and getting there on time could make all the difference in your experience and comprehension of the talks. Take come chill time: Again, the time between sunset and the first headliners is quite long. So grab some food, see the ends of some talks, and save your energy if you want to make it until sunrise. 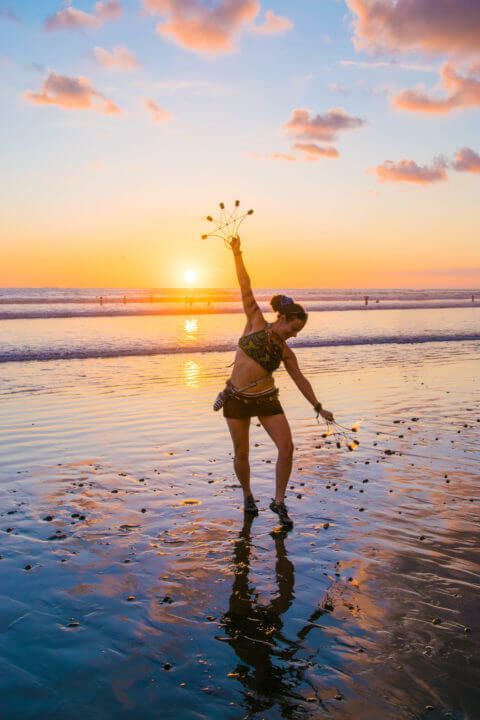 Vary your late nights and early mornings: To get the most of the Envision festival experience and to be able to see the sunrise one morning and maybe wake up for morning yoga on another, choose your nights to have late ones or early ones. I usually stayed up until about 4 and woke up at about 10/1030, but it would have been cool to be up earlier some days or even stay up until the sunrise more than once. Remember buying food and drink on the beach (rather than inside the venue) saves you money! Also remember that it will be HOT. A hand fan would be a great idea, or even a spray bottle/motorized fan. 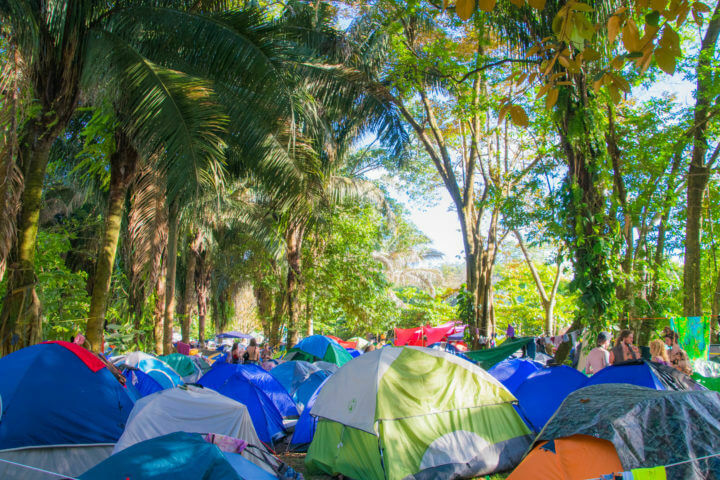 If you are coming to Envision from overseas, which I assume you may be, check my International Festival Camping Checklist to see what you should bring that will fit into your checked baggage. There are HEAPS of adventures to be had! Ziplining, surfing, rafting, animals, and caves are just a few things your could dip your toes into while here. There’s an amazing beach called Playas del Coco nearby, and tons of other adventures. 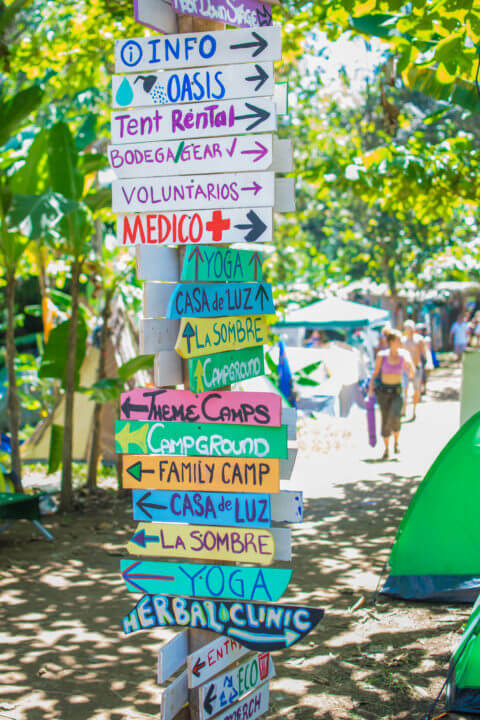 Check these out just as a teaser to ways you could extend your Envision Festival adventure! Tribal Gathering Festival Review + Guide - What is Tribal Gathering? Hot damn! What an article! SO amazing to share this experience with you! Thank you THANK YOU Dave!! Our first festival together was nothing short of incredible!